BOSTON--(BUSINESS WIRE)--Growth in the tablet market will depend on whether vendors can hit lower prices with Detachable 2-in-1s for a wider audience, and Strategy Analytics says new processor technology is crucial to make that happen. 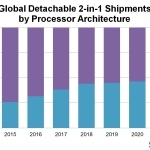 Arm and Qualcomm are working to make this a reality but without stronger marketing support, better resolution of compatibility issues, and a more coherent distribution strategy, Arm-based Detachable 2-in-1s will only comprise half of the market by 2022. Many vendors target the premium segment for enterprise and prosumers for a very good reason: high profit margins. The problem is that competition is fierce and there is limited room for everyone to succeed. As Gen Z enters the market well-versed in the worlds of Chromebooks and smartphones, expectations will shift for more mobile and cloud-based notebooks, which is a segment Arm and Qualcomm are heavily targeting.